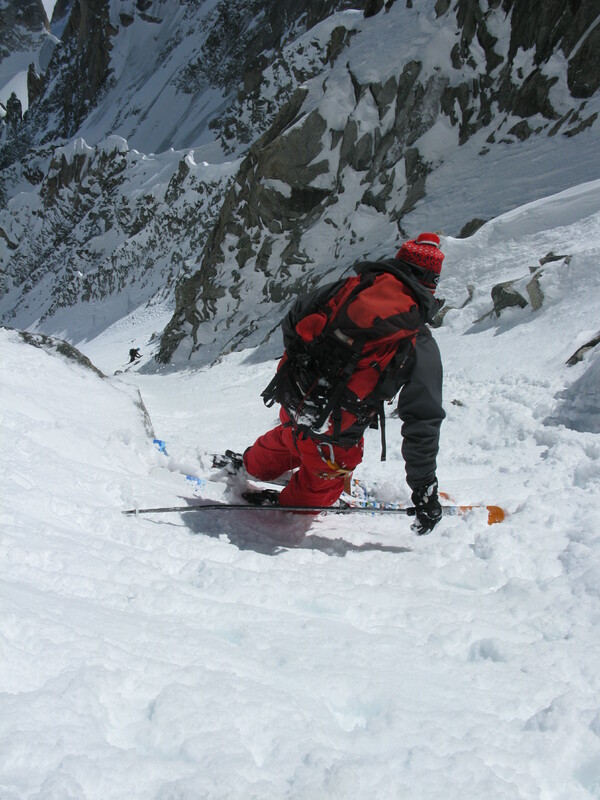 This descent is one of the lesser well known among the less well versed in steep skiing but a classic among the steep skiing community. 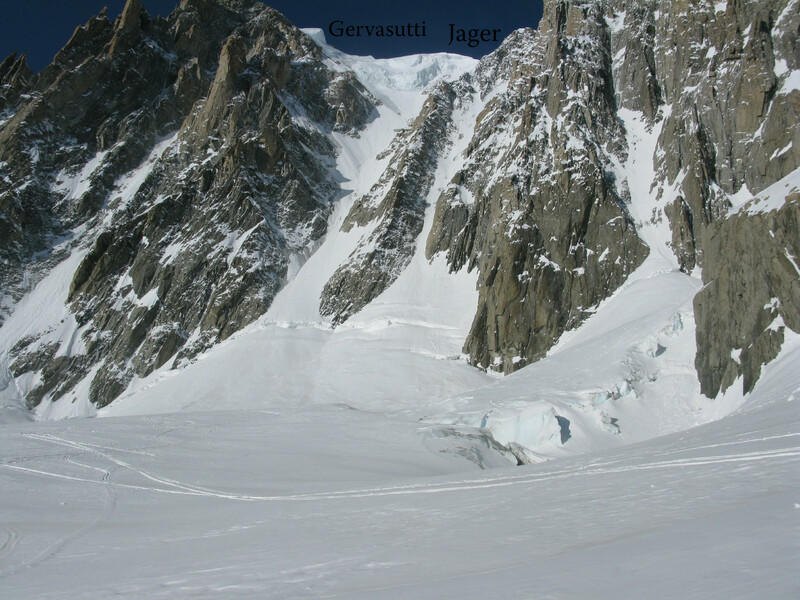 It sits next to the Gervasutti which is probably one of the best known steep descents in Chamonix. 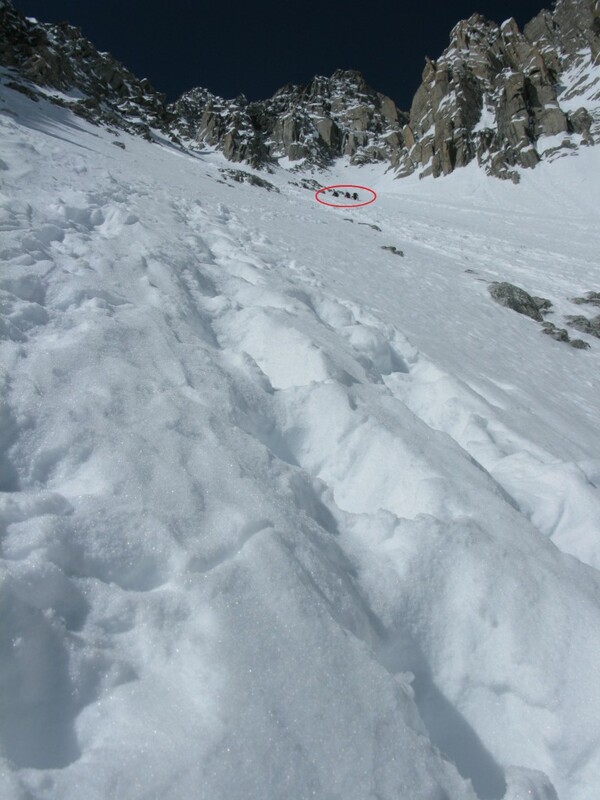 The Jager couloir is graded slightly higher at TD+ and 5.4. It doesn’t get much more difficult than this (unless you are Pierre Tardivel) as I found out….. 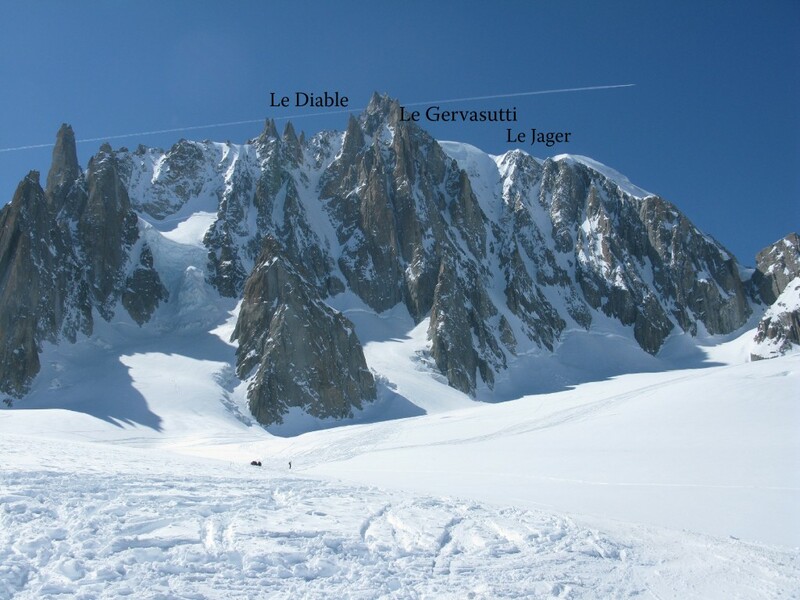 I couldn’t get the first bin and had consequently made arrangements with some friends to either meet them at the bottom of the Jager couloir or the Diable couloir. 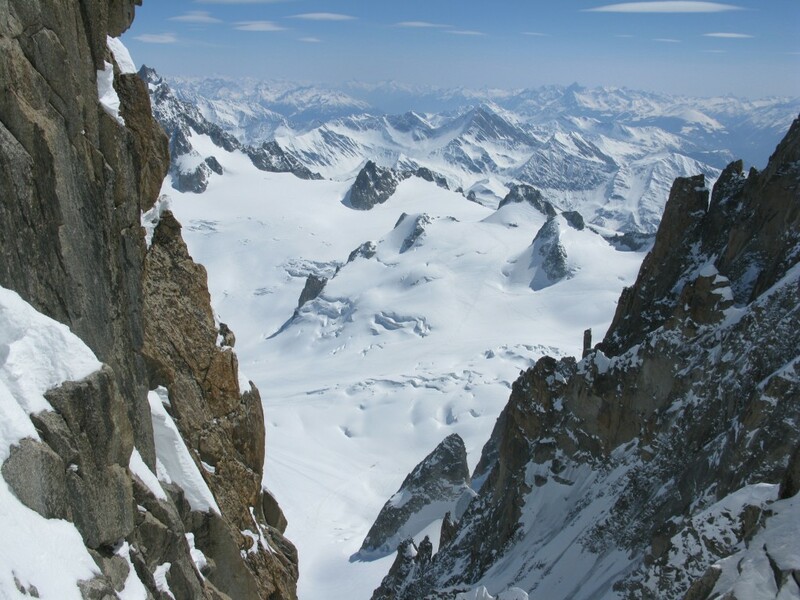 I could just make out one person climbing up the apron of the Jager couloir and thought it must be them, so put skins on and climbed up… only to find it was some one else. Oh well, I was there and another group had just arrived and turned out to be a really nice bunch, so I tagged along with them. Only 4 people to climb the Jager couloir to the top on a Saturday in Chamonix. Now there’s a surprise. The bergschrund was in two sections but really obvious and easy to pass and the climb up was pretty easy, especially as one person was making the boot pack all the way. It’s about an 800 to 900m climb depending on snow cover at the top. The snow was firm for most of the way and we managed it in about 3 to 3.5hrs. This really is a nice couloir that seems to go on and on. 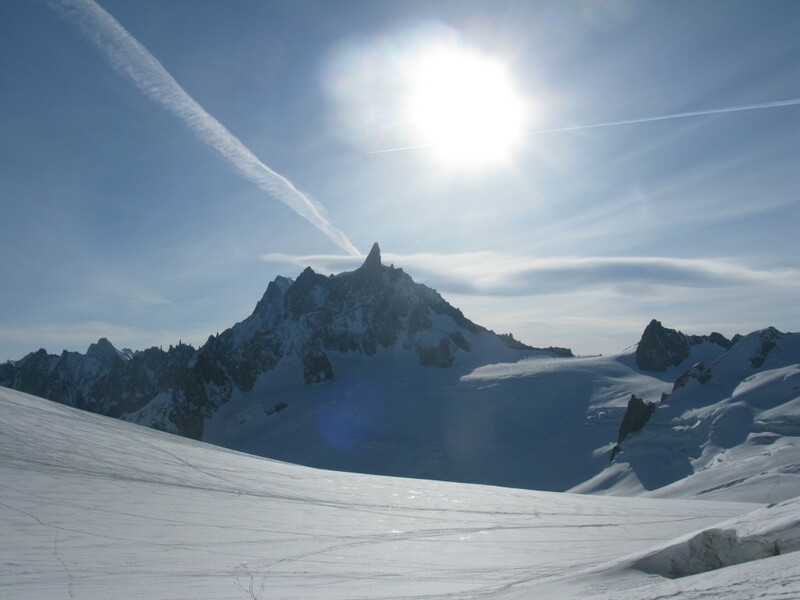 As you climb, it bends away to the right, so you can never really see the top until you are over half way up and affords some lovely views of the Mont Blanc massif. As the couloir faces East, it was getting sun only through till about 12.00 and we summited at around 13.30, so bar the very top section, it was completely in the shade again as we skied down. Not ideal. If I’m honest, the first bin really isn’t early enough (7.30) to give you an early enough start up the face and 13.30 is too late (that said, that is how most people roll here). 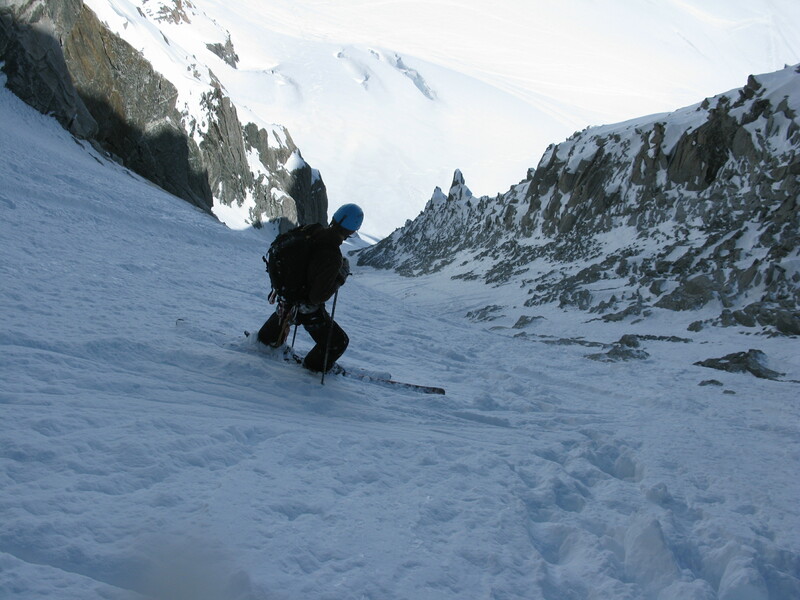 As a result and despite the width of the couloir, we were confined to a small strip of decent snow for most of the way down which meant a lot of side-slipping and nowhere near enough skiing. The very top section in the above photo was pretty ridiculous; slushy snow on nearly 60 degrees. I had trouble getting my edge in as the snow fell away with little edge traction on the lower layer (I was also the last one down, so not so much snow to play with). As you come out of this section and into the first wide part of the couloir, the snow was really good and you could do some really nice turns. 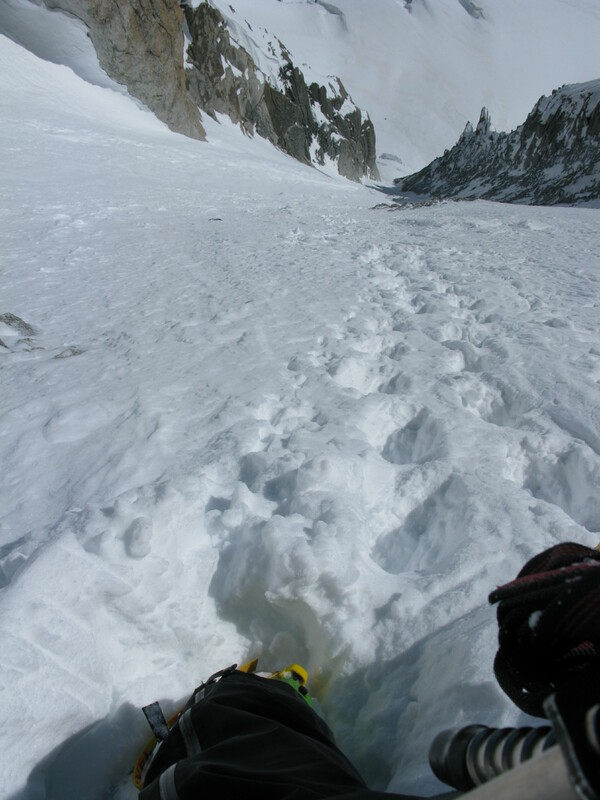 Then it’s down to something that looks like an icefall and you are forced skier’s right on a steep pitch again (55 degrees) for around 70m (more side slipping). 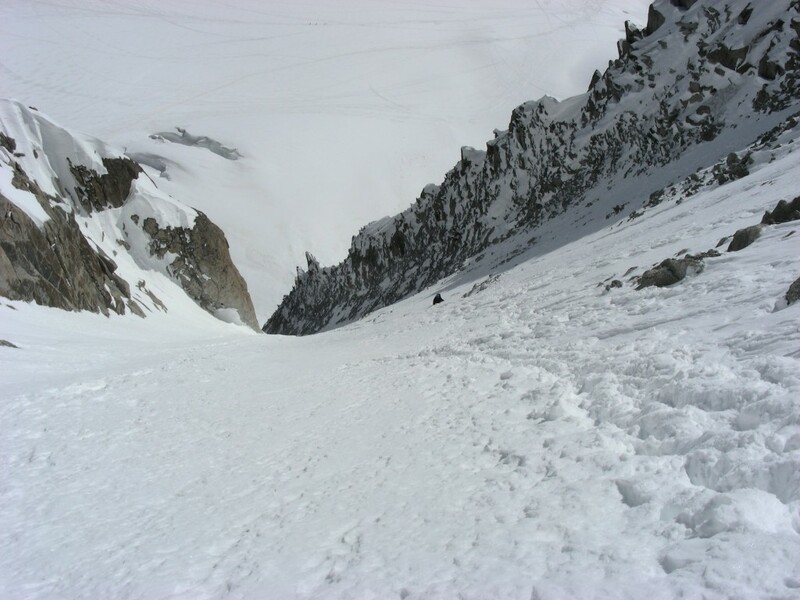 Then the last wide section which had been sun-baked and was consequently icy bar a section through rocky outcrops…… More careful skiing and then down to the exit which was icy on 45 degrees. Doesn’t sound very pleasant…..? I cannot say I had much fun skiing it! It felt like I only put turns down half the face if that. So, there you have it. 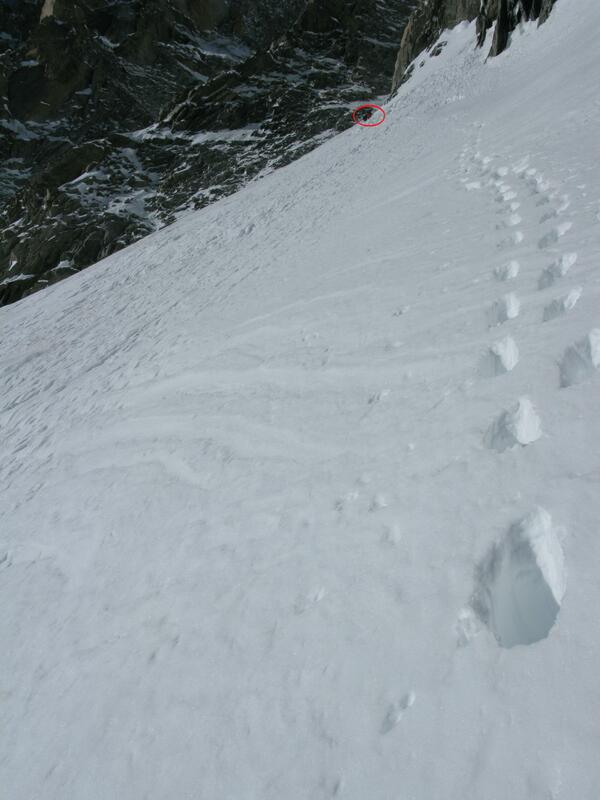 This is the realm of serious steep skiing and counts as my most serious, committing descent to date…. and with my splitboard. Not too sure if it was my ability or if the board was too soft on the steep, hard, icy sections. I just didn’t feel like I was getting as good an edge. Have any other splitters experienced this? For more trip reports in Chamonix, click here. 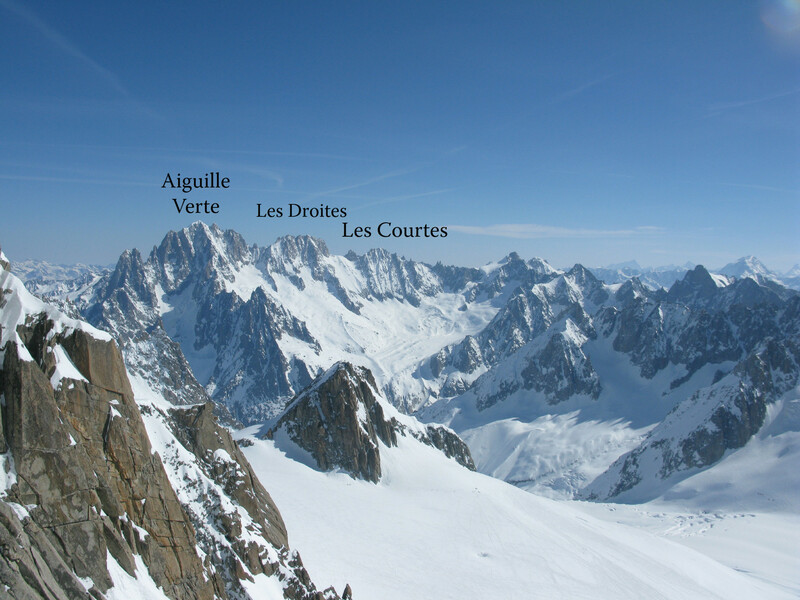 This entry was posted in Chamonix and tagged Backcountry skiing, Chamonix, couloir jager, Jaeger couloir, mont blanc du tacul, Snowboarding, Splitboarding. Bookmark the permalink. Good to hear from you. And thanks again for the boot pack ;). Unfortunately, I didn’t get any pics from you. I was the last one down and had a few issues on the top section, so drag my heels a bit. I’ll send you Jean’s mail though. Maybe he got some of you. Done any other nice lines since?